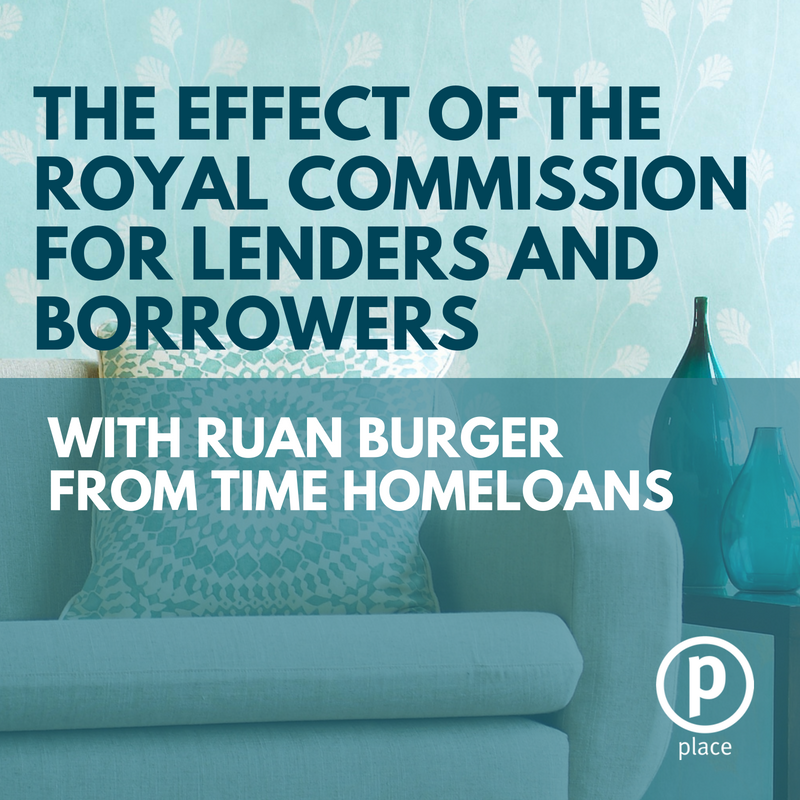 In this episode, we will be speaking with the Director of Time Home Loans, Ruan Burger about the banking royal commission. Ruan will discuss the changes, what this means for lenders and borrowers and ultimately whether or not this is a positive for the Australian market. Welcome to the Brisbane real estate podcast, where each week we'll be answering all of your questions relating to the local property market, with CEO of place estate agents, Damian Hackett. 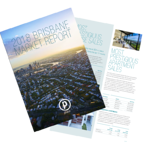 Be the first to get market insights, trends, and tips on everything you need to know when it comes to Brisbane real estate. To download a copy of our free Brisbane property report, head to eplace.com.au/podcast. Damian Hackett:	Welcome to the Brisbane real estate podcast. The banking world commission is a subject that's been getting a lot of air play recently and it has that effect on the the real estate industry. So today I've got with me a man who should know more than most about this Mr Ryan Burger, who is the managing director of Time Home Loans and is one of Queensland's leading finance brokers and one of my favorite south Africans, so welcome Ruan. So straight off the bat Rya, do you think the banking world commission has been good thing for lending? Yes, I do. I think at the end of the day its made things much clearer in respect of how the government wanna foresee see lending going forward and banks just taking a bit more responsibility and accountability for how they lend money. So you think maybe that a few practices that were happening probably weren't in the favor of the lender? Yeah I really do believe so. I think if you think we've got first party which is retail banking, third party which is through brokers and we had different rules. Through this now the rules have become quite similar. They cancel Verify applications anymore. They now have to go through the same processes that we have to oblige by. Okay so there's more transparency. So people borrowing money should be better off? I think they would and its also...even its a thing from the from a general living point of view, they've started changing in the way they look at how much a family would spend, versus just putting a number in there. Now we we have to go and start looking at bank statements and make sure that their spending is in line with what we say is their general living per month. 100 percent. I think the way banks are coming back now and asking more questions, we now know that they are checking statements which is fair to say eight months ago they didn't, because the questions are just significant. What they [inaudible 00:02:43] on the outside of the equation is that it makes us take the time here too, to truly ensure that if someone does have certain debts, we have answered those questions, we understand where those debts... how they apply and what clients are doing. So I guess what you are saying there is while for some people it may impede their ability, perhaps get a lot of proof however, it's probably gonna be better for them in the long run because at least somebody might get themselves into trouble you will [inaudible 00:03:13]have a track with account services. 100 percent.. I think we forget that we're on the best interests rates spectrum that we've ever been. Having rates under 4% it's not something we've ever seen before. Over the last 23 years, the average interest rate, was 7.25 percent. If we were to go back there, you just have I ask the question today how many people would be able to survive making the extra payments. Yeah. Has it made the change.. since world commission has it made much of an impact on first home buyers? I think it has because we used with banks the poverty index which was just [inaudible 00:03:52] $800, where now it works on their income. So suddenly they may have a general living expenses of $2000, so what they could borrow and what they they could borrow today is two different places. The other thing too is there's more of an impact now on the first home buyer, to try and ensure that the funds that they do have is genuinely safe and if it isn't genuinely safe that enough inquiry has been made, that they truly have the capacity to meet requirements. So if you look at the impact of the outcome, has the government actually made any more regulations or has it been more the bank's reaction. What's been your experience? Banks reacting and I think tat this stage, like any well run business you prefer someone not to mandate you. So you'd rather proactively try and make changes, and if those changes are sufficient then its business as usual . I think those changes, some of them have been too far fetched but I think like all things, things comes up [inaudible 00:04:52] it's gonna come a time where they go well listen maybe we got to let things go a little bit here. And the reason for that is only banks is in the business of lending money. So if you stop lending money, we have a different problem. If somewhere [inaudible 00:05:04] perhaps they [inaudible 00:05:06] way too much do you think that might be again to stop regulation coming down on top of them, they give themselves the leeway maybe loosen up a bit [inaudible 00:05:14] goes on. 100 % I think also banks have taken a different approach here they have looked at it and gone, we haven't done this right but I think they forget that they've had two systems running They've had retail banking doing whatever they like to do. and then they've had third party which has been every day of the week, which are very much regulated. So from that point of view, I think what is going to be good that's gonna to come from this you gonna have one set of rules and also having one set of rules it's much easier than to dictate how can you help the clients and that's a benefit. So from your perspective its more a level playing for field. While the short term, while people have difficulty getting some loans through. I mean have you noticed that in the last period of time. Yeah, there's a bit more work to go into things now. you've got banks being a little bit silly. A WESTPAC is a good example where they will come back and say you have to put down interest rate, you have to put a balance into the dollar. The reality of it is this is for WESTPAC clients. What you mean by balance into the dollar? So that's slowed down the process. What was the turn around time before they make an inquiry in a sense? Well for the banking inquiry , I think why things are taking longer is because you've got an assessor now and doing three times more work on a deal than what they did before. So that could put another two or three days in it. And in the same happen when a deal gets approved now going through the certification of lend documents, even that process now seems to be slower but, and this is my take on it, but I do believe there's less people now in the bank too than there were 12 months ago. So still a busy market, less people doing things, having to do more. But I guess from your perspective now with the experience you've got, even with the change from the regulation, if somebody sat down with you, you get a pretty good idea as to where they'll get a loan through wouldn't you? what is your change your perspective? You'd be able to look at a budget now and say you've got it to get through? No, not at all. It is just now depending on what bank you choose. So I'll give a good example ANZ is a big bank for us when it comes to auction putting. They still approving deals for us in two days. Okay. So we, we and Damien as would know even just to replace timing home loans is meeting a seven day finance [inaudible 00:08:15] for a lot of agents today. All we ask is to see that client before they sign a contract and that's just the upcoming sensational. Okay. What would be the impact I guess you've seen before they sign the contract? Before they sign a contract is that we now can go to the bank, have the conversation, get a buy in from the bank and already start the process so by the time they sign that contract, everything is well in motion. Yep, do you think people... you find people are a bit more nervous about their ability to lend, follow the banking world commission, with the people you talk to like do people bring it up in the initial meetings or ? No, I think like all things when a client sits with us in that moment we give them the comfort. If they were a nervous that was maybe before they came to us, but when they sit with us and we have clear indications of how we can assist them to get that finance one as quickly and it's painless as possible. Everything becomes quite easy from there. Okay Ruan what would you recommend for somebody thinking about to refinancing a loan? One thing we have learned with lenders is that will never come to you and say you should have a better deal, but the market has become so competitive with funding being as cheap as it's ever been That you now are in a position that you can drop least .5 to 1 percent off the rate that you've had three years ago. You've got a bank like Virgin Money that are just coming up in the last few weeks that will give you a rate at 3.68 percent and give you 10,000 points for every 100,000 you borrow, and a 1000 points every month as long as your balances over 50,000. So the points are just ... I mean that's a whole lot of and getting a rate second to none like 3.68 everyone just has to think about the rate and you know you're not losing. So for People its worth the effort of going through and making a change. 100 percent and I think the best part about that is that if we do a refinance, you really take a step back or take two steps forward for a client to say this is where you at, this is now how it looks, we run what we call a comparison calculate in respect of what you were paying. Now if we look up and say [inaudible 00:10:29] and how much you now pay. when people can pay 3 to $5,000 a year less they're buying. That's a variable rate. If you look at the fixed rate 3.88 percent, its still very competitive. I guess what's the history there, if someone comes in, they offer a great way to get people in are they likely then jacked it up a bit to try and get som money back like is there danger in that? If you think about the rate for what the rate is. If you had a rate for two years and you save money and in two years that rate goes up the beautiful thing is people can think with their feet its gonna cost you 700 to a 1000 dollars to move from one lender to another. For those two years you've benefited. Has the inquiry itself impeccable visibilities to move other things trying to make it easy for people to move from one bank to the other. Has there been any evidence of that? No not at this branch. I think you have to be careful there I think the inquiry knows this as well. People and they will move thing for everything. If you do something like that, you gotta look at the end and go would they have really been in a better position. When you keep on paying 700 to 100 bucks somewhere it's gonna get caught up with you as well so. So is it the right cost for them to move? So you've gotta have some real vantages to work out through that process documents. And make sure that at the end of today if you do more, there's a reason for it. If there's a great saving behind it or there's every reason to do so. So do you think the fallout from the Banking World Commission, have we seen all of it today? or we are it may still happen down the track? I think there'll be more but then for the same token, they've created the review to already combat a lot of bad behaviors in banks. That I think we will see of a lot too and that's again, trying to be proactive and not leave anything to a mandate. All these things have cycles, I think at the end of today certain things had to happen and they are already in motion. If we look at the clients at the end of today this there for their protection and if that's the only thing that happens through it, that's a good thing. Has it been the market will be since probably wasn't a result of the banking world commission but some of the of the plan that seem to be more regulated by the banks, certain areas they are less likely to lend? So what would you think of the 10 percent benchmark? No its been lifted, that's unregulated now. You gotta ask the question if is saying to the banks this time we'll let you think for yourself, but just bear in mind we can step in at any one time again. Because no one bank has come out that market to try and get more business. So you gotta ask yourself the question what's happening behind the scenes. Yeah they probably think that, that they'll jump on it. They'll be straight back on top of it. So as far as the investment lending part of the market, the world Commission hasn't actually impacted on that, you can tell. No I think what has done more than a year ago has already brought changes in and that is already calmed to market in many ways. the reality of these banks now making decisions and it's not left now to regulators. So I guess a question, all the talk about the about commission, the PR the hype the goes around it is a real thing. There are real challenges. The biggest change is general living. It is really taking stock on a client's financial position. I think lets..
[inaudible 00:15:00] if you have to think about it the rate we have is so good. If rates do go up tomorrow by 2 or 3 or 4 percent, what does it mean to the Australian market? 100 percent and people have to live in a house which means they have to buy one, most people have to get a loan to fund. There's always gonna be banks lend money and there's always gonna be people that wanna borrow money. It's just now about taking the time to set that person in such a position that they're one, not over committed and two, get good rate, one that helps them to get there faster. Well that's great news Ruan. I guess I can breathe a lot easier having a sit down and smacking it out about the.... get the account from the roayl commission so really appreciate your time and thanks for spending it with us today. To download a copy of our free property report into eplace.com.au/podcast.